White Pine. Our common Pinus strobus is a wonderful wood to use for most purposes if you can get wide, clear, heartwood plank. I am not speaking of the pumpkin pine once so common in Maine. I refer to the second growth pinelumber cut from trees more or less a hundred years old. There are not many of these left; therefore the hunt for this sort of pine is one that may take you far afield. For best results in pine, I emphasize the fact that the stock must be clear. Nothing is more annoying than to have a carving three quarters done and then run into a pitch pocket whose presence in the stock was not foreseen. If you do have this happen, there are two solutions: one, cut out the pitch pocket and fag in a "dutchman"; the other, throw the carving out the door. White pine lends itself to carvings where the detail is not too small and where long, sweeping modeling cuts are wanted to shade in or develop the larger detail. Care must be taken to see that your tools are always razor sharp. This fact is true for working on any wood, for that matter, but most essential for work on pine. Long cuts are best made with the run of the grain of the wood. Shorter sweeps can be made diagonally across the wood; but directly across the grain, short cuts give better results. 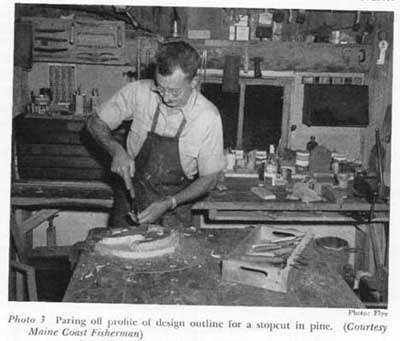 In working in pine, care must be taken in driving tools (that is, malleting) to make stopcuts; otherwise the stock may split out to the edge of the carving or fracture with the run of the grain. I usually depend upon the strength of my hands and arms to make stopcuts in this wood rather than drive the tools. Pine is best used if the piece can be gessoed and then either painted or gilded. By using gesso on pine, any errors or small fractures in the detail can be modeled up and it is a further insurance that sap spots will not bleed through the applied finish. the results came up to expectations. My only objection to walnut is that there is a lot of curl in the grain that sometimes, in fact most frequently, is not visible in the face of the stock when work is started. The tightness of the grain precludes long, sweeping cuts.